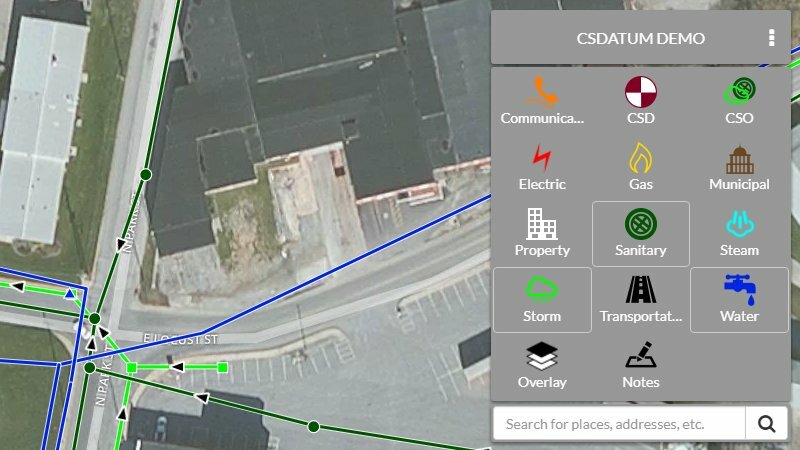 Some call it GIS, a digital file cabinet or even an asset management tool but at its core, it's a web-based mapping application that we, a civil engineering firm, have built from the ground up. 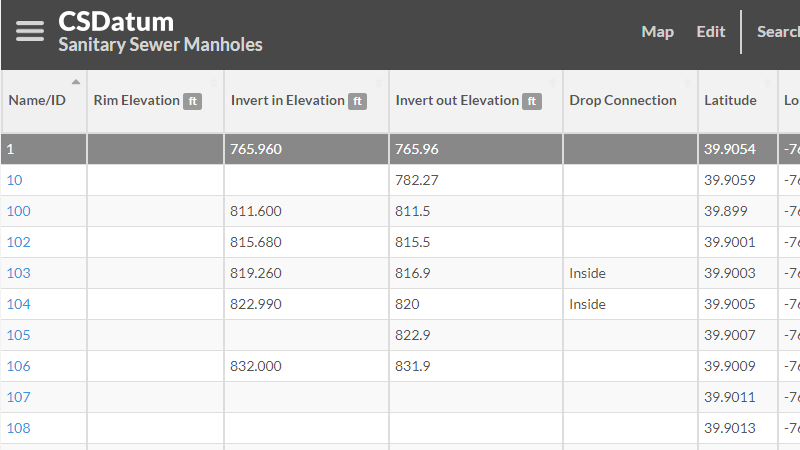 We made it because we couldn't find a simple, intuitive tool that was tailored to the roadmaster, building owner, municipal manager, MS4 coordinator, public works director or civil engineer. Need a handout for your Board or curious coworker? Download or print this summary. Add new content or move existing points and lines with ease. Type in notes, attach as-builts, take photos or file an inspection report. Search, sort, edit, filter and export information - right from your browser. 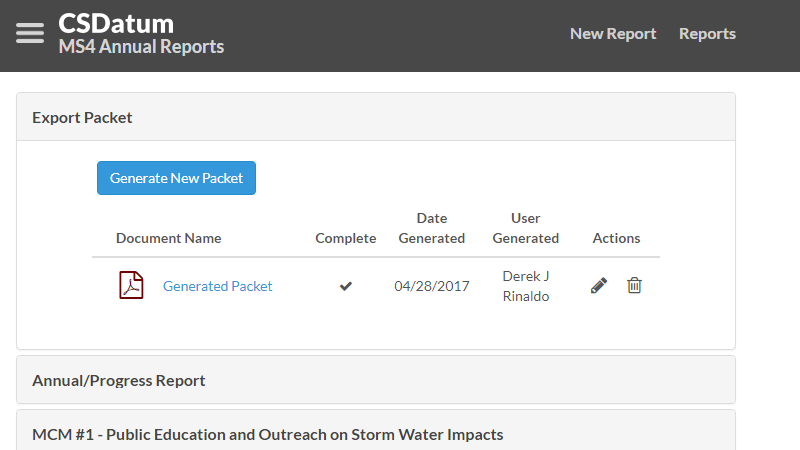 Upload and track your MCM activity and create a finished PDF for PADEP. 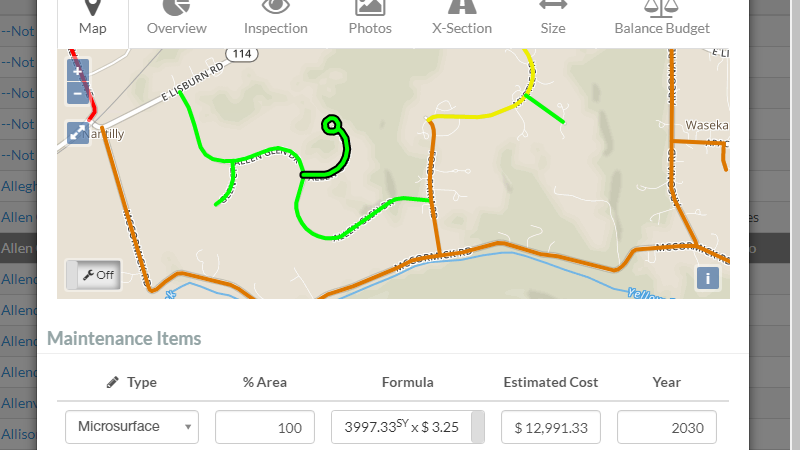 Inspect your road inventory, generate a condition map and make recommendations alongside your budget. What kinds of assets can I add to the map? Here's the short list: roads, bridges, sidewalks, buildings, underground/overhead utilities, some permits, signs, subdivision records, manholes - almost everything you'd need to manage as a facility or infrastructure owner. Here's the full list of assets. Some permits - what exactly does that mean? CSDatum works great for PennDOT Highway Occupancy Permits, PADEP permits, Conservation District permits, etc. If you want to track and manage building/zoning/code enforcement permits, you might be interested in our other service, Permit Manager. We partnered with CS Graphx in early 2017 and are actively rebuilding the program into a web-based program. Subscribers of both will be able to effortlessly jump between programs in a familiar interface, all under one login. So it's just a map? Why is any of this unique? This isn't a new product. Very true - but most are too complex to use or don't have 90+ years of civil/structural engineering experience influencing them. This application is an extension of who we are, not just another piece of software. So it's more than just easily mapping your assets, it's also about managing those assets. 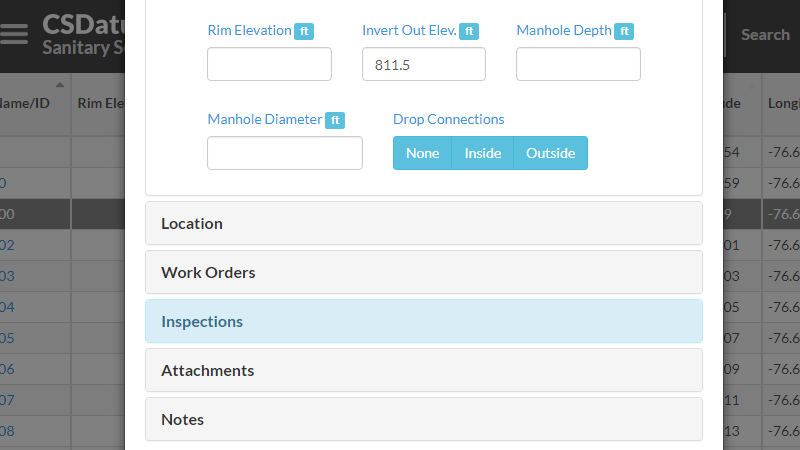 Quickly generate an MS4 report, make long-range plans for your roadway system, track outstanding work orders or completed repairs on your rental units or determine how many Stop signs in your Township are out of compliance. We're constantly building tools in CSDatum to save you time and money. This all sounds great - but how much does CSDatum cost? We've tried to keep this simple, so it's $2400 per year. Unlimited users. Unlimited storage. One flat rate, that's it. If you're a municipality in Pennsylvania, the annual cost of the program is Liquid Fuels eligible! Just to be safe, we encourage you to consult with your local municipal services representative before proceeding. Unlimited storage? Are you crazy? Perhaps - but it's time to double down on simplicity. We want you to focus on your infrastructure needs – not how many bits and bytes you’ve gobbled up. We do slightly compress your photographs during the upload process to a reasonable file size (1 to 3 MB). Due to server limitations, you cannot upload a single file larger than 19 MB (which is huge) but again, you can upload as many 19 MB files as you wish. Because charging per seat frustrates us too. Unlike most engineering software, we do not charge per user. You maintain your own account, settings, users and passwords. Our prices are all-inclusive — $2400/year means $2400/year total - no hidden charges. The annual subscription is obviously a one-year contract. You can choose to renew or cancel at the end of the contract. How often do you update the program? How will I know what has changed? The program is constantly evolving and we typically publish a new feature every month or so. New updates are communicated via our 'alert' system and a full listing can always be found on our News page. We hate to see you go - but if you decide to cancel; we can export your data into traditional GIS files. All of your data will remain safe & secure. Please review our Terms of Service for the fine print. Our goal is to always be fair and reasonable, we're engineers after all. Please review our Refund Policy for the fine print. What equipment do I need to use it? An internet connection and a web-browser. Any modern phone, tablet or computer with Safari, Chrome, Firefox or IE 10+. We recommend using devices with at least 2 GB of RAM for best performance. At this time, we do not have an 'offline mode' or a mobile app (iOS or Android) so steady internet connectivity is required. Is my data secure? Are you ever offline? Our cloud servers run 24/7 in a secure, offsite facility and we back everything up on an hourly, daily and weekly schedule. We deploy industry standard encryption practices to ensure your data and passwords are safe & sound. On the rare occasion we take CSDatum offline for maintenance, our current window for swapping code is between 12 to 3am (Eastern Standard Time) each Monday. If for some unforeseen reason we'd need to take the site offline outside of this window, we will alert all account users via email. We work very hard to limit these occurrences and our goal is 100% uptime. Since we've launched, we've been online 99.8% and the marginal downtime was planned. What if I already have my assets mapped in a GIS system? Great start! We can import any of your existing records into your account. It's also a two-way street, as you can export your content back into traditional GIS files. As precise as you can locate the point or line on aerial imagery. In most cases, we feel this is accurate enough to store & track data. If we're importing existing GIS data; we preserve all coordinates to the 7th decimal (I.E. -76.0123456). Is this like Google Maps or a handheld GPS device? The program has the limited ability to 'locate' your location based on your wifi connection or data signal - or search by street address. At this time, it will NOT be as accurate as GPS device or one of the phone/tablet apps you're accustomed to using. To learn more about this feature, read our update. What map background are you using? How often is the imagery updated? At this time, we're using the Mapbox platform (Street and Aerial view) which utilizes the World Geodetic System (WGS 84) projection. We do not update these layers, all of the map content is maintained by Mapbox. As the account administrator, you can create as many users as you want and set different permissions for each one. For example, a Township Manager could have full admin control, a Supervisor could have 'view only' access and a Roadmaster could add & delete content (but not add users). Ask away! We'd love to hear from you - drop us a message on our contact page.